Winding 64 miles through southern Colorado and northern New Mexico and jointly owned by the two states, the Cumbres & Toltec Scenic Railroad is the crown jewel of remaining narrow gauge steam railroads in the western United States. From the scenic beauty of Toltec Gorge and the 10,022 foot high summit of Cumbres Pass, to the historic yards and facilities of Chama, NM, the Cumbres & Toltec is a must visit for any fan of steam railroading. For further information on the line, please visit the Cumbres & Toltec Scenic Railroad website. UP 3985, known as the Challenger, is the largest operating steam locomotive in the world. UP 844 was the last steam locomotive built for the Union Pacific - known for a short time as 8444 due to a numbering conflict with diesel power, the big Northern class engine now sports its original number once again. Based in Cheyenne, Wyoming, UP 3985 and 844 venture out several times each year on special excursions, tours and exhibitions. For further information, visit the special trains section of the UP's website. A true national treasure, the Georgetown Loop represents the last remaining segment of a once extensive narrow gauge line with branches which extended from Denver to various mining regions. Sadly, the Loop as pictured here is now gone. Despite over three decades of flawless operation, the Historical Society chose not to renew the Georgetown Loop RR's contract following the 2004 season. GLRR's experience, dedication and professionalism will be sorely missed. Thanks for the many rides and memories guys. Further information on the former Loop operator may be found on the Georgetown Loop Railroad, Inc website. A new operator using new equipment was chosen starting with the 2005 season. Information on current Loop operations may be found on the Georgetown Loop Railroad website. Tucked away in the Basin and Range country of eastern Nevada, the Nevada Northern Railway is the classic western shortline RR Originally built to serve the region's extensive copper mines, the railroad is now a living museum, featuring 3 steam locomotives, extensive historic yard facilities, and both mountain and valley branches with over 32 miles of track. The Nevada Northern is operated by a small core of railroad professionals, assisted by a dedicated group of volunteers. 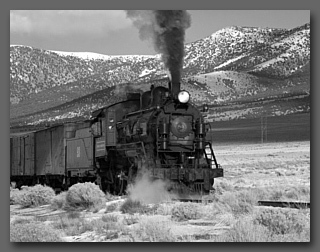 Further information on the Nevada Northern may be found on the Nevada Northern Railway website. Perhaps the best known narrow gauge line in the west, the Durango and Silverton features a ride through the scenic San Juan mountains to one of Colorado`s best preserved mining towns. For further information, please visit the Durango & Silverton Narrow Gauge website.